“Run for Readers” Andrew Fundraiser: At Andrew we know all “Readers are Leaders.” Our students are raising money to buy additional books for our book room by participating in our 2nd annual Color Run on Friday, September 8th during our Iowa/Iowa St. celebration day. Pledge sheets will be going home with each student on Friday September 1st. Please help your child gather pledges and put any money collected in the envelope provided and bring it back to school on September 8th. Please have your child bring a shirt (mostly white if they want to see the color) that they can change into for the run. Students will be messy when they come home! 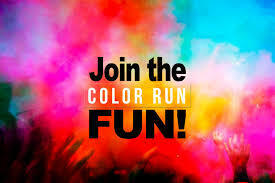 Feel free to come and join in on the run or watch your child turn “colorful.” All students are welcome to participate in the color run even if a pledge sheet is not returned!